Today in Masonic History James Knox Polk passes away in 1848. James Knox Polk was an American politician and the 11th President of the United States. Polk was born on November 2nd, 1795 in Pineville, North Carolina. In 1806, his family moved to the Duck River area of Tennessee. The family prospered in Tennessee when Polk's father became a land speculator and a county judge. In 1812, Polk had a health scare and was forced to have surgery to remove urinary stones. During the surgery the only anesthetic was brandy and Polk was awake during the entire surgery. Prior to the surgery Polk was home schooled. After he recovered in 1813, he enrolled in the Zion Church. Later he attended an academy in Murfreesboro, Tennessee. In 1816 he transferred to the University of North Carolina where he graduated. It was in college that he sharpened his oratory skills which would serve him in his later political career. In 1819, Polk was elected clerk for the Tennessee State Senate. In 1820 he was admitted to the bar. His first case was the defense of his father he had been arrested for public fighting. Polk's practice took off due to the number of people in debt due to the Panic of 1819. In 1822, Polk joined the Tennessee Militia. He was later promoted to colonel and put on the Governor's staff. 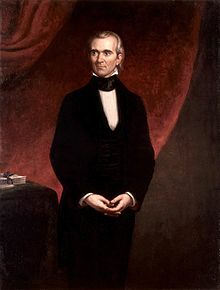 From that point on Polk was referred to by his military rank or as the "Napoleon of the Stump" for his oratory skills. In 1825, Polk ran successfully for the United States of House of Representatives. He would be seated at the age of 29, which some felt was too young to be seated in the House of Representatives. He ran for reelection in 1827. The following year, Polk's mentor and political ally, Andrew Jackson ran successfully a second time for the President of the United States. Polk began to support Jackson's agenda in Congress. In 1834, Polk ran, unsuccessfully for the Speaker of the House. He ran again the following year and was elected as the Speaker of the House. He continued to support Jackson's and then Van Buren's policies during their respective presidencies. Polk would become the only person to date in United States history to be elected as the Speaker of the House and President of the United States. In 1838, Polk left Congress to run for Governor of Tennessee, which he did successfully. He served only one term as Governor and would run two more times being defeated both times. In 1844, at the Democratic National Convention Polk hoped to win the nomination for Vice President. The two front runners were unable to win the super-majority needed to gain the nomination. Polk was asked to run for the nomination and promised that he would serve only one term, hoping to win the support of the two front runners, giving them the hope that they would be able to run again in 4 years. After gaining the Democratic nomination, in the national election, the big issue of the day was the annexation of Texas which had won it's independence from Mexico 8 years before. The Whig candidate was indecisive on the issue. When the debate over the Oregon territory was added, Polk came out as the decisive candidate. During Polk's one term as President he had four agenda items. Reestablish the Independent Treasury System, reduce tariffs, acquire some or all of the Oregon territory (it was partly controlled by Great Britain) and acquire California and New Mexico from Mexico. He accomplished all four items on his agenda in his single four year term. Although the Oregon territory and the annexation of Texas were controversial mostly due to the issue of slavery. Polk was accused of being an instrument of the "Slave Power". Polk passed away on June 15th, 1848 at the age of 53. He had the shortest retirement of any United States President to date, which is 103 days. He is also one of only six United States Presidents who passed away while their successor was in office. Polk was a member of Columbia Lodge No. 31 in Tennessee.